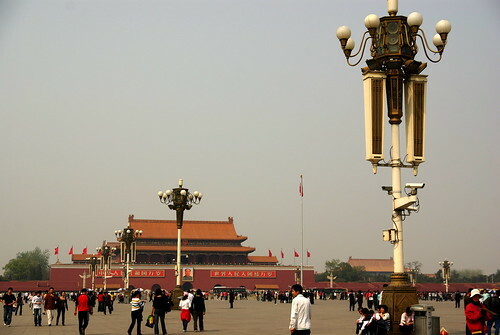 Don Murray, former correspondent in Beijing, the first permanent one in the Chinese capital for CBC/Radio-Canada, in 1980, just wrote an essay on the 19th anniversary (already, eh) of the Tian’anmen Square events in 1989. He commented on the Sichuan Earthquake, and made remarks on the government’s role in its coverage by the media. In places like Hong Kong, tens of thousands of people still participate in the annual “6/4” (which is how it’s called by Chinese, for the date it happened on, June 4th) candlelight vigil. I am quick to highlight the comments left at the bottom of Mr. Murray’s article. They are apparently from Chinese people emigrated to Canada, and point out that what the normal folk wanted from the protests in 1989 was merely a denunciation of corruption, and a better livelihood for the ordinary guy. This has been my reading of the events, also, since watching Gate of the Heavenly Peace (Wikipedia), a documentary made in 1995 by PBS. Today, I participated in a dramatically different series of events, aimed at commemorating the Sichuan Earthquake. Undeniably, the Chinese flag was everywhere to be seen. I am just starting to understand the relation between the flag, the nation, and its government. I do think that loving China, being a supporter of the Olympics, say, is a separate business as loving the government and supporting everything it does. I understand that China is a very populous country, roughly, um, 45 times the population of Canada. I understand that governing its people takes a strong voice at its center. Like one of the commenters is saying (their comments recommendation system rocks – why doesn’t Radio-Canada.ca have one too? ), people complaining about China often don’t know its history, especially in the past 150 years, when it went from being colonized by foreign powers, to being divided by civil war and a weak central government (including stuff like the Taiping Rebellion). It’s not say that they should give the current government a blank check on everything. Change can occur, like it did in Taiwan and South Korea, two brutal military dictatorships until the late 1980s (effectively, Japan has been overwhelmingly a single-party country for all the post-war era, and so are Singapore and Malaysia). I think it inevitably comes with economic freedom. The people governing China are doing it, we hope, for the good of its people. Maybe there is a part of self-preservation, but I am optimistic that what they want is the country’s progress. As the people get richer, there is no way that they wouldn’t want to enjoy more freedom in their daily lives, including in society decisions – political decisions. One thing that we tend to forget in the West, is how satisfied the people actually is with its government, told me one expatriate living in Beijing that I met on my trip there, almost two months ago. Look at how Wen Jiabao has be lauded by your ordinary Joe, PR operation, or not, his face part of every local Chinese-language newspaper and relief effort poster – he even has a Facebook “be a supporter of” page, can you believe! It will be extremely interesting to evaluate, a few months down the road, what the effect of the Sichuan Earthquake on Chinese society will have been. . What if the earthquake never occurred? It may have had the effect of a late afternoon thunderstorm over people’s Olympics-overheated heads. It may have allowed China’s leadership to try out just how much loose they can provide their “harmonious society” with.